Some would call this next statement a risk – but I wouldn’t: If the following doesn’t capture your attention around the issues of the body/brain connection and its relevance in the real-business-world – nothing will. Nothing. However, given this is are written for you – an individual – let’s imagine the repercussions to your business. What if you had diminished ability to relate to (better yet exploit) risk? When you engage in risk taking you transform into a different person – a kindred spirit with athletes, politicians and soldiers – anyone that ventures beyond their safety zone. Incidentally, while John’s work was in the living laboratory that is Wall Street and London – academics from across the world, in a wide range of studies, have also shown similar phenomena in the lab. 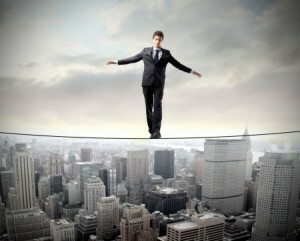 A few examples: a collaboration of scientists from the U.S. and Spain looked at why CEOs make risky choices; researchers at the University of Southern California studied whether men or women took more or less risks when under stress; and another multi-university examination looked at whether or not a board’s diversity is good or bad for risky decisions. As with most academic works – a large part of the value here, in my opinion, is the numerous sources it lists. There is hard science at play here. Much of the preceding and the following are based on John’s writings and some ideas we exchanged based on his business and academic career. Cortisol, the steroid hormone, pumps glucose and free fatty acids into our blood to meet whatever physiological demands (fight or flight?) we may face. It also pushes back any bodily functions – say digestive, reproductive or immune systems (note the latter – it will be relevant in subsequent posts) – that are not necessary for survival. So, what John calls our “challenge response” is another way the body and brain unite to function as one. Remember, this is “fight or flight” we are talking about so we are talking a quick decision and quick impact – we are not designed to handle biochemical disturbances on a long-term basis. Basically, we are built to “turn on” for a couple minutes or couple hours (couple days at most) and then “turn off.” Our caveman body (and mind) is purposed for fighting – or running from – a tiger rather than the Wolf of Wall Street. The nature we are intended for is actual nature, not the nature of business. I believe everyone – from the trader on Wall Street to the business manager on Main Street or from the professional athlete to the weekend warrior – understands slumps or losing streaks. It is these times that mess with our mind (and body) the most. We question our decisions repeatedly so the biochemical disturbance (in this case stress hormones) lingers in our head and in turn advances a chronic risk aversion. And as far as the body goes, once the stress hormones get into your blood system they can lead to an onslaught of viral infections, elevated blood pressure, ulcers, weight gain and more. For many people, the dread of a distressing task is much worse than the actual task. That’s where John’s “challenge response” comes into play. As our defense mechanism, it prepares us for the unknown challenge. But if that challenge has the potential to linger for an unknown amount of time then our mind (and body) are in trouble. And finally (my wife would never forgive me if I did not give credit where credit is due) John’s research also reveals that when men and women are exposed to chronically-raised levels of cortisol, it is the men who place “too much importance on smaller risks” – not the women. What’s a businessperson to do? As the saying goes – if I knew this I would be rich. But I can at least share some relevant information with you (by the way – let me know what works!). The following are, clearly, broad stroke but at least I don’t avoid the issue. I might add that in keeping with my objective to only promote things I have seen work that I am comfortable putting these two on your radar screen. Keeping in mind much of our resilience comes in our genetics and is further modified as we develop (nature and nurture), I assume the ability to adjust is not limitless – at some point part of the strategy must be avoiding stress. We have previously highlighted the value of exercise to a healthy and productive body/mind in various other posts (e.g. plasticity) but here are some salient points from John Coates. In some cases, drawing from the programs of top-class athletes, since they are the people with the most experience of controlling their hormones and emotions in the interest of optimizing performance. Any stressor can exercise the stress response. 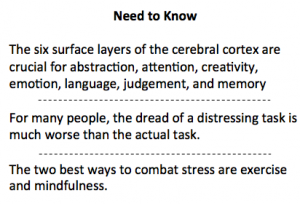 Stressors, if brief and repeated, can enhance resilience. Those exposed to stressors are not as prone to learned helplessness. Exercise increases productive capacity amine-producing cells (helps us fight anxiety, stress, depression and learned helplessness). Produces what John calls “Brain fertilizer” to strengthen brains against stress and aging. Exposure to cold temperature – to mount a quick and powerful arousal, relying on adrenaline more than cortisol. Exercise supplies a pattern of stress and recovery when partnered with acute thermal demands. The second approach that I am convinced is effective centers around ‘mindfulness.’ While mindfulness has been incorporated into meditation and yoga, I’ll stick to it in its simplest form. The benefits go on but you get the point.